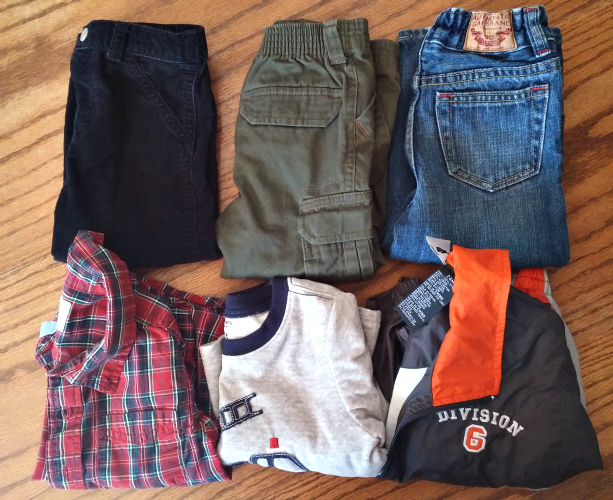 With the cooler months quickly approaching, I have been getting my son’s fall and winter wardrobe together. He had been given a few outfits and shirts already, but I needed to get some more clothes to fill in the gaps. If you would like to see a few more pieces that I found, check out my video. There is a local consignment shop that has random sale days with 20% off the entire store and it shares those sale days on FB. I liked its FB page and chose to see its notifications first. That way I know whenever a sale is going on. A few weeks ago I picked up some PJ’s that were originally $3, but were on sale 20% off for $2.40 each. JC Penny’s has some great coupons. I am a rewards member which means that I receive coupons in the mail every so often. Last year JC Penny sent out the coupons several times around the holiday season. I am hoping they will do the same this year. Last month I had a coupon for $10 off of a $10 purchase. 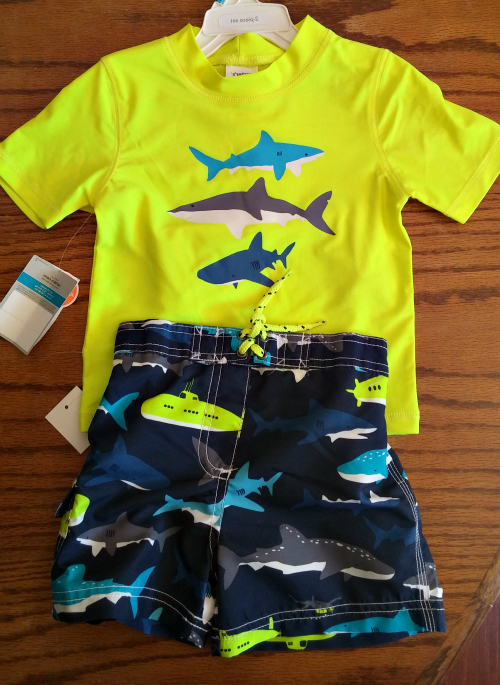 I was able to get this swimsuit set absolutely free! I’m not a big fan of getting my clothes at thrift stores because it takes SO long to go through all of the clothes. The store around here sorts clothes by color rather than size. This completely overwhelms me especially if I have a toddler in tow. 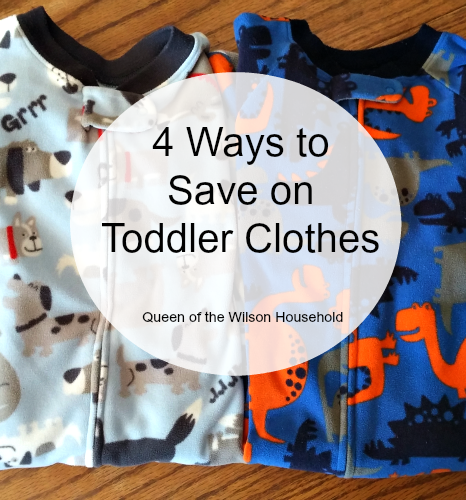 But I do like to look for baby/toddler clothes because there usually isn’t as many clothes to look through. The last few weeks I picked up a few pairs of pants and shirts for $1.50 each. That is a great price! The pants jeans were Baby Gap and the green pants were brand new. It felt like I hit the jackpot with those finds! I heard about Schoola through Sweet and Simple Home. Schoola is an online consignment shop that only sells children and women’s clothing. I received a $10 credit by creating a collection. Then by signing up for their emails, I was notified of a free shipping promotion. I used the $10 credit and free shipping. After my first order, I was able to receive my $15 referral credit. Shortly after that, Schoola had another promotion: 50% off all clothes + Free Shipping!! 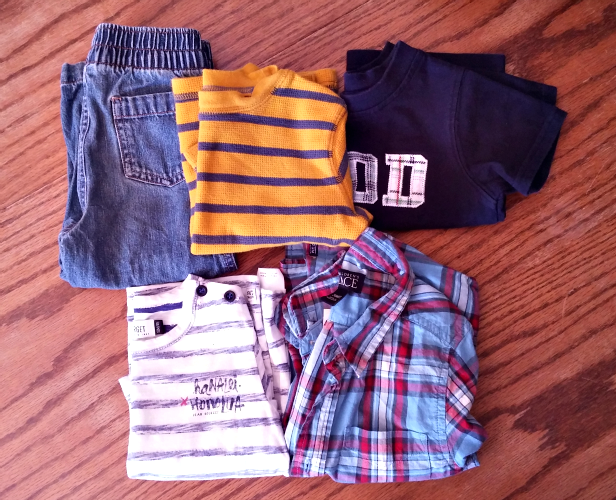 I was able to get $25 worth of free clothes for my son and a few items for me! If you would like to check out Schoola, you can use my referral code. We will both receive a $15 credit after your first purchase. Pretty great deal! Great tips – there are also bunch of Facebook groups where people sell their clothes – lots of times you can even find something completely new. I love finding new clothes as second-hand! Thanks for sharing about the FB groups. I have never tried them. Well done, Emily! I've found some good deals on Schoola as well. I need to unpack the next box of hand-me-downs we were given and see what gaps we have for winter. I am so thankful for hand-me-downs…and try to return the favor to someone else when we are done with clothes. Hand-me downs can be such a blessing to get and to give! 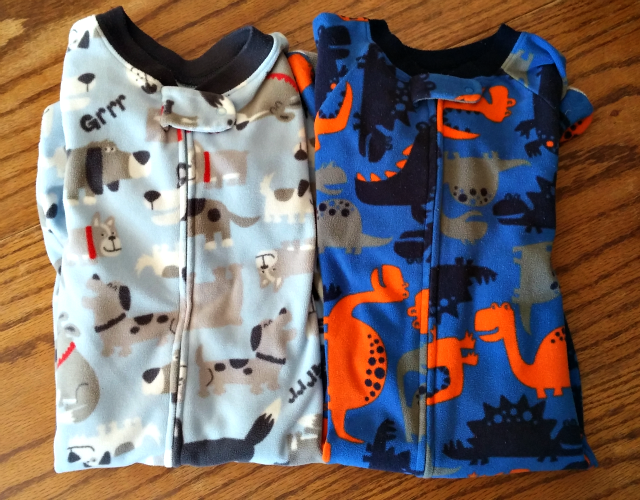 Caleb was given some too, but they are 3T so it will be a little while until he fits into them. I love all of the great promotions and sales on Schoola! Great tips! We got almost all of Sophie's clothes from exchanges (local), thrift shops or handme downs or they were bought for her. We're just not reaching into the buying of new items for her now that her height is slowing down. Although we do go buy new shoes for her since she's grown out of every single hand me down pair. I've heard of local exchanges but never tried them. That sounds like another great way to find toddler clothes. Isn't it crazy how fast they grow out of their shoes? !